Bernard Parker had scored in the first half to give Amakhosi hope, but Morgan Gould’s moment of indiscretion and a last-second miss from substitute Lehlohonolo Majoro meant the Buccaneers were the ones to advance to Saturday’s decider in Durban. It was a lively and feisty opening without either team creating any clear-cut chances. Happy Jele did well to take a Siyabonga Nkosi cross off Parker’s head, while the midfielder also shot over the bar from a tight angle after dispossessing Lehlohonolo Maselesa when a cross to Knowledge Musona would have been a better option. On 12 minutes a Siphiwe Tshabalala corner caused problems in the Pirates defence – a sign of things to come – when Jele cleared Willard Katsande’s toe-poke over the bar, before Musona rifled a shot in which Senzo Meyiwa parried to safety. The Buccaneers’ first real chances came a minute later when Kermit Erasmus ran at the defence and unleashed a shot which flew inches wide of Itumeleng Khune’s right-hand upright. Daine Klate got away with only a yellow card on 16 minutes for an over-the-ball challenge on Tshabalala as referee Daniel Bennett had his hands full with some overzealous tackles. Erasmus was proving a handful playing just behind Bacela, running at the defenders and dragging them out of position. Once such run saw him go around Morgan Gould, but his effort to find a teammate was a poor one. The former SuperSport United striker had an even better chance on 28 minutes when Klate’s cross found him in front of his marker, but his header went high and wide. Chiefs started gaining the upper-hand as the half drew to a close, with Musona in particular causing headaches. One of his shots was blocked for a corner by Rooi Mahamutsa, and from the resultant set-piece the opening goal came. Again Pirates failed to deal with Tshabalala’s corner-kick, allowing Tefu Mashamaite a free header which Meyiwa could only block to Parker, who swept home from close range. There were two more chances just before the break as first Musona mis-directed a header from Nkosi’s cross, before Erasmus saw his goalbound shot blocked. Sifiso Myeni replaced Tlou Segolela at the start of the second half and immediately caused problems. His clever through-ball found Erasmus, but once again Mashamaite came up trumps with the block. 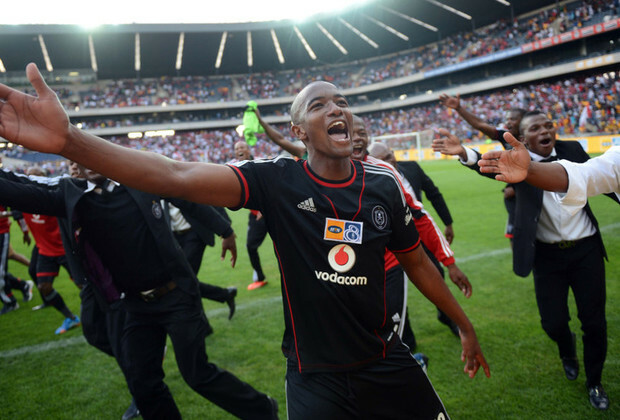 Musona then had a thunderous free-kick saved by Meyiwa before Bucs had their best chance. A corner found Sangweni at the far-post and he headed back into the danger area, where Lehlohonolo Maselesa saw his header crash off the crossbar. The tension was building as Pirates continued to press, with Chiefs’ three front men – Parker, Nkhatha and Musona – all getting yellow carded in the space of three minutes! Mashamaite was again on hand to block a goalbound Bacela shot on 73 minutes, but just a minute later and the big call of the game – Gould penalised for a tug on Mahamutsa’s jersey from a corner, and Bacela converting from the spot. Now leading 2-1 on aggregate, the home side opted to protect their lead, bringing on the defensive-minded Manti Moholo for Erasmus and sitting back to soak up the attacking pressure. The tactic almost backfired as Reneilwe Letsholonyane had his trademark burst into the box and fired off a powerful shot, but Meyiwa was more than up to the task. 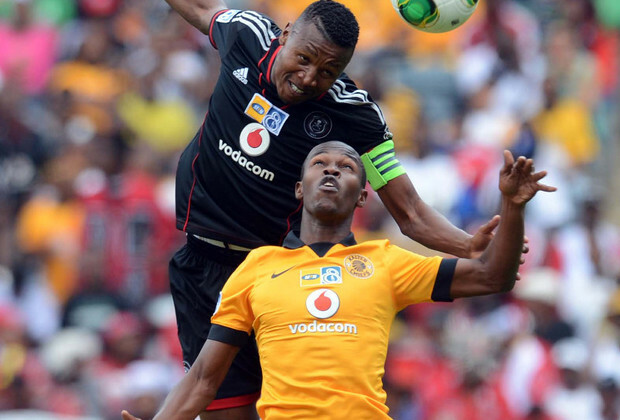 Chiefs continued to push and the cards continued to stack up – nine yellows – while Majoro missed a gilt-edge chance with the final kick of the game, but Stuart Baxter’s team just couldn’t get the second goal as Pirates hung on for the aggregate win to come out trumps on all fronts in a very testing eight days.